The Radeon RX 500 series have come out to play in the mainstream graphics space armed with higher frequencies. AMD's chief aim is to ensure that these GPUs, based on the existing RX 400 series, offer enough extra performance to make the choice between them and GeForce GTX 1060 easier for the consumer looking to spend between £150 and £250. Having seen RX 580 strut its stuff in the form of the Sapphire Nitro+ OC, we now turn our attention to the cheaper RX 570. This time around, it's PowerColor who gets the AIB nod. RX 570 is reckoned to have a base TDP of 150W that powers the 2,048 shaders at peak cores speeds of 1,244MHz. PowerColor sees the whole RX 570 proposition differently, especially with its Red Devil iteration. Heck, the company believes that heavy-duty cooling is the order of the day now, as last year's RX 470 version of the same name was a much more restrained affair. What you get now is a triple-fan card sat on top of a mainstream GPU. Measuring 310mm long and 128mm high, it thankfully remains a dual-slot card. We're not sure why PowerColor would go so overt on cooling, particularly as the underlying GPU is clocked in at 1,320MHz, or just 50MHz higher than the dual-fan RX 470. Build quality is reasonable and the backplate offers some more rigidity to a card that weights just south of a kilo. The trio of fans switch off at low loads but the under-load noise is somewhat different as you will see later on. Memory speed, meanwhile, is kept at a default 7,000MHz, and knowing this is an RX 570 card, there's 4GB of GDDR5 memory onboard. Nvidia and AMD's partners have different thoughts on how to present and cool competing cards, with EVGA's GTX 1060 3GB almost half the size. Those who don't want to get so adventurous in size can opt for the PowerColor's Red Dragon instead, offering a lower core speed but smaller form factor. 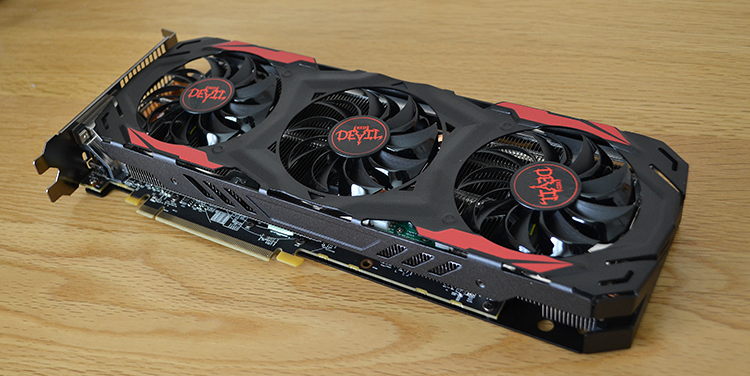 The Red Devil logo lights up when the card is operational, but PowerColor, perhaps sensibly, avoids any RGB lighting. Power is sourced by a single 8-pin connector wedged between the heatsink and shroud, and it's capable of delivering 225W of power, which should be enough even with this RX 570 is overclocked. A problem facing all board partners is price. AMD wants to mark out the RX 5x0 series as genuine improvements over last year's cards... but that's not the case. The upshot of such an approach is that RX 570 4GB pricing is currently comparable to RX 480 4GB, meaning that you receive less performance for more money. PowerColor's over-the-top card comes in at £190 right now, consistent with the RX 480 4GB - a card that has more shaders and, oftentimes, a higher peak core speed. Such pricing concerns are somewhat out of PowerColor's hands, mind. A single HDMI, a trio of DisplayPort and the ever-popular dual-link DVI make an appearance on the back. Let's now see how it performs against the GeForce GTX 1060 3GB and 6GB duo.